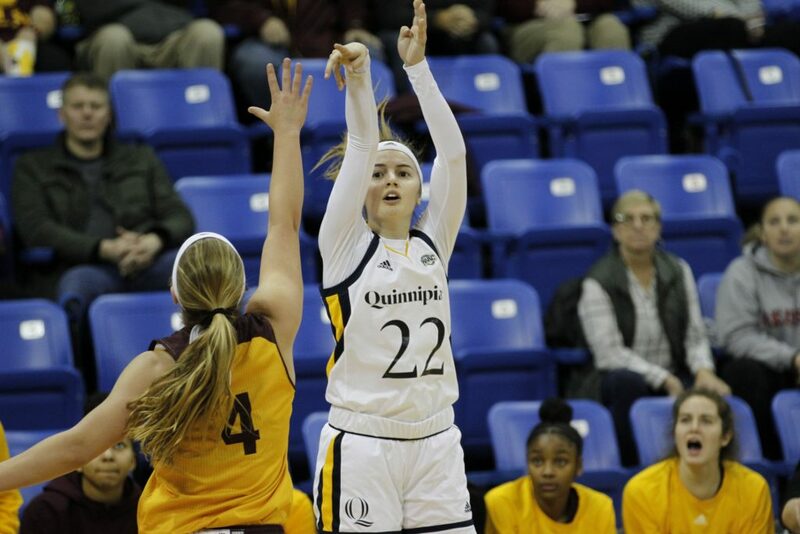 The Quinnipiac Bobcats women’s basketball team (15-6, 10-0 Metro Atlantic Athletic Conference) will face the Niagara Purple Eagles (11-11, 7-3 Metro Atlantic Athletic Conference) for a Thursday night matchup on Feb. 7 at the People’s United Center in Hamden. The first-place Bobcats are coming off of a 72-56 home victory against Rider on Sunday. Coming off an 81-57 win against Saint Peter’s, the Purple Eagles are currently sitting at fourth in the MAAC. Jen Fay currently leads Quinnipiac in points (11.3), rebounds (6.4) and assists (3.2). However, with Fay out, the Bobcats must look to McClure to be the number one scoring option on this team. McClure is second to Fay in points (10.3), rebounds (6.1) and assists (2.5), and she had a team high 22 points in the Bobcats’ last game against Rider. Quinnipiac will look to her to repeat what she did against the Broncs’ and power the Bobcats to another win. Moore leads the Purple Eagles’ averaging 16.1 points per game which is good for third in the MAAC. She had 21 points in the Purple Eagles’ last victory against St. Peters. To get to first place in the MAAC, Quinnipiac has done everything right on the court. However, their strength is the ability to score the basketball. Quinnipiac as a team is averaging 64.4 PPG while their opponents are averaging 52.3. The Bobcats’ scoring margin is 12.1 PPG. Rider is in second place in the MAAC with a 7-2 record. In Quinnipiac’s last game against Rider, Quinnipiac won by 16 points. Nobody in the MAAC this season seems to be a tough matchup for Quinnipiac and they expect to breeze through another conference matchup. If the Purple Eagles’ are going to hand the Bobcats’ their first conference loss since Feb. 6, 2017, they will need to limit Quinnipiac’s chances with the basketball. Last time these two teams met on Jan. 18 Quinnipiac routed Niagara 96-55. In that game Quinnipiac set a season high in points (96), field goals made (39) and field goal attempts (80). Niagara will have to change its defensive game plan to avoid a repeat of Jan. 17.